The 2018 edition of the QS World University Rankings: Asia demonstrates that BINUS UNIVERSITY is rapidly climbing the ranks of Asia’s best higher education providers. From the 426 universities ranked in Asia of which 23 are in Indonesia, BINUS is now TOP 9 university in Indonesia, 1st private university in Indonesia, and in the 251-260 ranking tier in Asia. Since 2013, BINUS moved up from place 400+ to 251-260. Over the 5 considered years, the institution moved up 3 times without any negative performance. 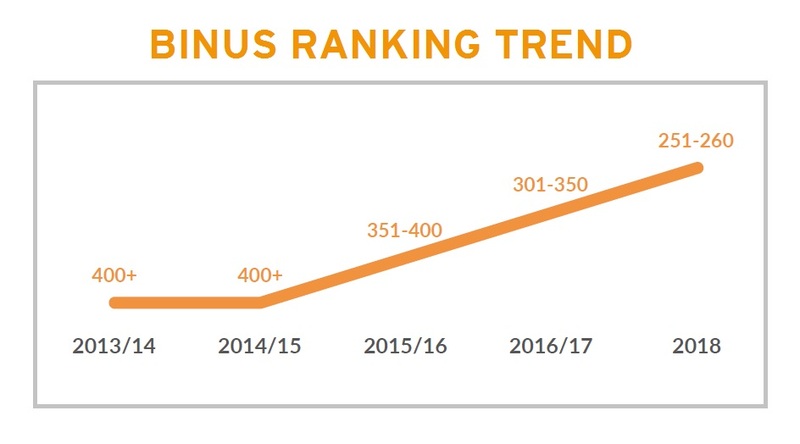 This ranking trend is followed by the fact that BINUS has climbed 90 ranks since last year (301-350 tier). Moreover, BINUS ranks among the top 10 in Indonesia, moving up two ranks since 2017. This achievement is a result of the university’s continued dedication to its vision as the world class university in continuous pursuit of innovation and excellence. More specifically, BINUS has worked hard over the past year to enhance the teaching quality, research and internationalization, as some of the key indicators examined by QS Quacquarelli Symonds, the global higher education analyst. The university has scored particularly well on inbound and outbound exchange and also employer reputation. 2 in 3 of the university’s graduates work in global organizations or become entrepreneurs. Over 400 international students visit BINUS annually. This was made possible through strong connection of the institution with over 5,000 industry partners and 130 universities worldwide. The university has further implemented different schemes encouraging research collaboration among BINUS faculty as well as a scholarship program enabling the faculty to pursue doctoral degrees. To strengthen its world class university status, BINUS regularly participates in reputable international audits. Next to QS World University Rankings: Asia, BINUS expects to soon hear results of the latest QS Stars Rating, navigation tool helping universities understand their strong points. Currently BINUS holds the maximum five stars in employability, teaching, access, engagement and facilities. Moreover, BINUS is the 1st university in Indonesia to become accredited by EFMD EPAS assuring international quality of its International Accounting and Finance program. We are also the third university in Indonesia to hold international ABET accreditation for our Civil Engineering, Industrial Engineering, and Computer Engineering programs. With these results, BINUS continues to be one of the key higher education institutions in Indonesia educating the next generation of the country’s leaders. These results also demonstrate the growing trust in the Indonesian higher education system on the regional stage as Indonesian institutions climb the global university rankings. BINUS is proud to be one of these world class knowledge institutions in the country. Please join us to celebrate our leap.